The Eagle Scout designation is highly respected because only 4 percent of all Boy Scouts are ever granted this prestigious rank after fulfilling the many years of requirements that must be achieved. On Saturday, January 5th, twelve African-American young men reached the ultimate milestone of being awarded the Eagle Scout distinction. 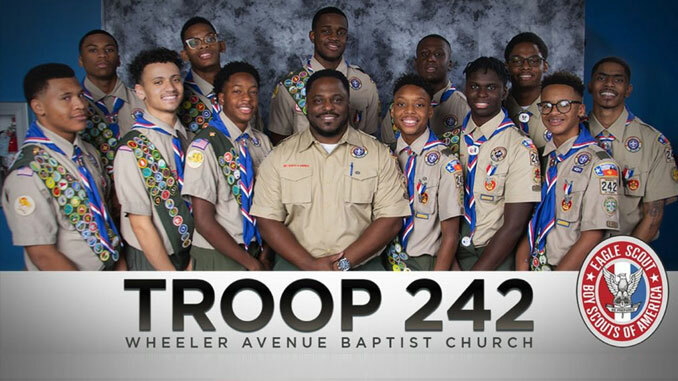 Boy Scout Troop 242, led by Scoutmaster Dameion Crook, Sr., presented the 12 African-American Eagle Scouts during the Eagle Court of Honor ceremony that was held at Wheeler Avenue Baptist Church. His son was one of the newest Eagle Scouts, which is the cherry on the top of Scoutmaster Crook’s two years leading Boy Scout Troop 242.